About a month ago I headed up to Martha’s Vineyard for a weekend visit. Ever since my friend and colleague, Tim Boland, became Director of the Polly Arboretum in West Tisbury four years ago I have been making at least annual visits to Martha’s Vineyard. 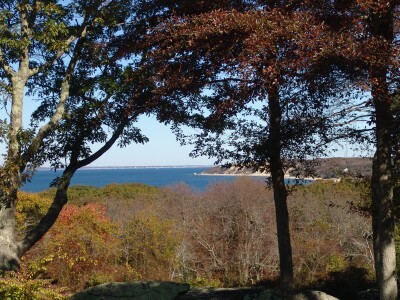 Regardless of the season, Martha’s Vineyard’s natural landscapes are stunning. Of course, it is well known for its stunning seashores and picturesque beaches, but Martha’s Vineyard also boasts many other natural areas and botanical treasures throughout the island including the Polly Hill Arboretum. Throughout the Vineyard are native pockets where interesting plants abound. 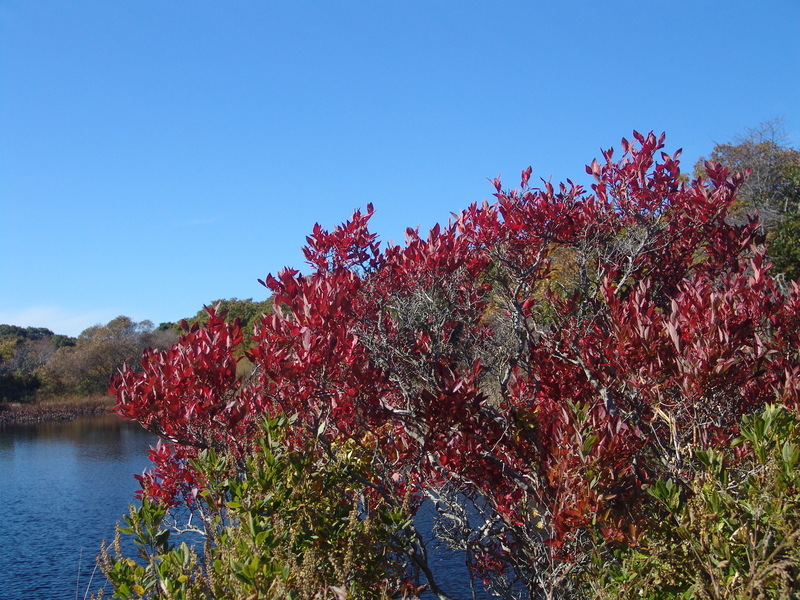 Fresh water ponds boast masses of Ilex verticillata, winterberry holly; Aronia arbutifolia, chokeberry; Cephalanthus occidentalis, buttonbush, and in the fall you can’t miss the dazzling red foliage of the highbush blueberry, Vaccinium corymbosum. This island is home to many interesting native trees including several oaks such as the dwarf chinkapin oak, Quercus prinoides; bear oak, Quercus ilicifolia; and white oak, Quercus alba. 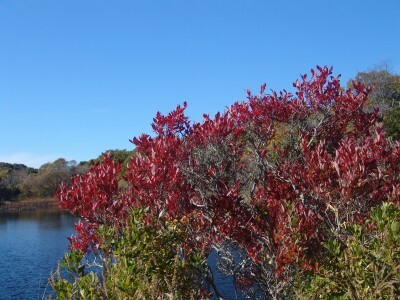 My favorite tree on Martha’s Vineyard is also a native found in our Crum Woods, the black gum or sour gum, Nyssa sylvatica. On Martha’s Vineyard the common name is beettlebung. This colloquial name is derived from the cask making industry. The “beetle” was the wooden mallet and the “bung” was the wooden cork or stopper. Because of the intensity of the winds the beetlebung trees have a flat-topped, wind-swept appearance. In the fall, their architectural form in combination with the fire engine red fall color is truly dazzling. 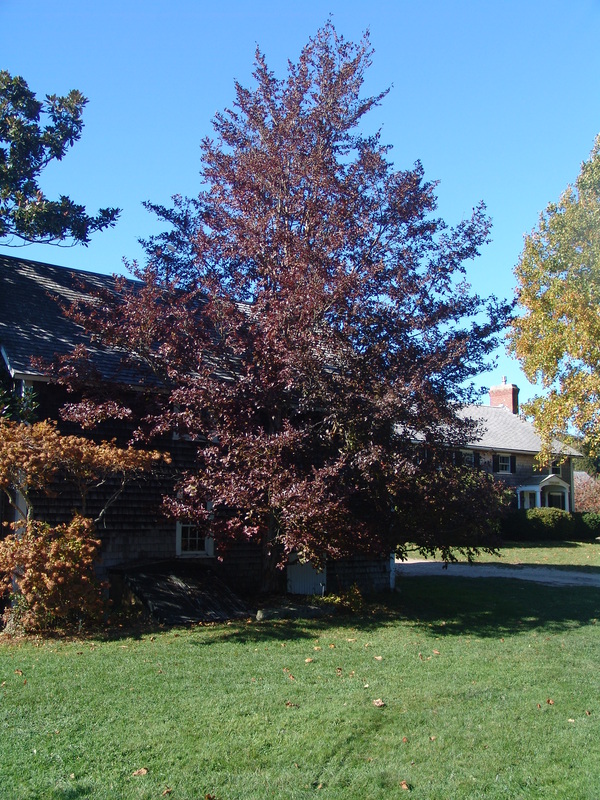 West Tisbury is the home of the Polly Hill Arboretum. Polly Hill, a native of Delaware, and her family vacationed on the Vineyard for decades. Just over 50 years ago Polly started planting the family farm with plants she had propagated from seed. While Polly always had an interest in horticulture, she was busy raising her family and did not embark on planting the property until the age of 50. As the plantings matured she became nationally recognized for her plant collection, as well as her plant selections and introductions. Her specialties were azaleas, hollies, stewartia, dogwood, and magnolia. She developed the West Tisbury Azaleas, as well as, introduced several cultivars of deciduous hollies and stewartias. In total she selected and introduced 83 cultivars. Polly died last year after turning 100 years old. Today, the Arboretum has a full-time staff that continue to carry out the mission of the Arboretum. Many of Polly’s trees have matured into wonderful specimens. The Arboretum holds the NAPCC (North American Plant Collections Consortium) national collection of Stewartia. The Arboretum also manages a beautiful central meadow and many acres of native, peripheral woodlands. 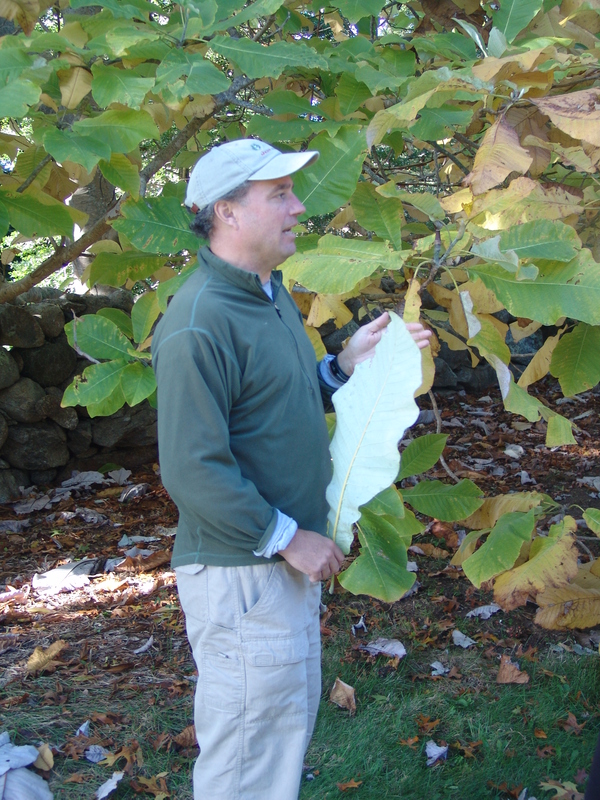 Please join us at A Winter Celebration at the Scott Arboretum on January 10th, 2009 to hear the Arboretum’s Director, Tim Boland (also a former Scott Curatorial Intern 1985-1986) present a lecture “Growing On-Island: A Horticultural and Botanical Tour of Martha’s Vineyard.” Register for this lovely evening now by calling 610-328-8025! Also, call or email Julie Jenney, Education Coordinator, for more information or an itinerary about the September 2009 trip to Martha’s Vineyard! Can some one tell me what those plants are on the beaches of Chappyquidick that look like cherry tomatoes? Can you send me a picture to abuntin1@swarthmore.edu and I will see if I can identify them. The question about beach plant that looks like cherry tomatoes …. those are the beach rose, or rosa rugosa. That’s an old post, but I think this is your answer.